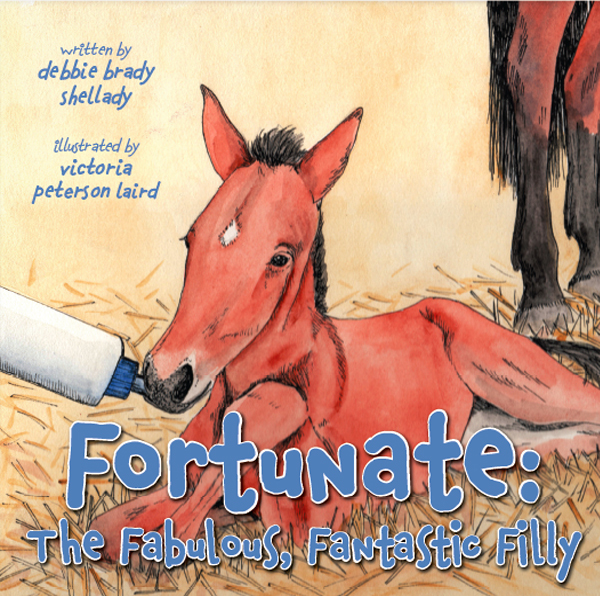 Fortunate: The Fabulous, Fantastic Filly, written by Debbie Brady Shellady and illustrated by Victoria Peterson Laird, is the latest children’s book published by the Write Place. It tells the true story of Fortunate, a foal that is born three weeks before she is expected. Small and shivering, Fortunate is soon rushed to the Lloyd Veterinary Medical Center at Iowa State University, where she stays for three weeks. When Fortunate returns home to West Branch Horse Farm, her mother and their human friends work together to help her grow big and strong. Like Shellady’s first book—The Horse That Ate Christmas, which was published by the Write Place in 2016—Fortunate is based on actual events. Shellady is an avid rider and has boarded her horse at the real-life West Branch Horse Farm for many years. One chilly March morning, a foal—named Fortunate—was born almost a month premature. After receiving medical care, Fortunate eventually became a champion horse and had a foal of her own. Debbie Brady Shellady worked as an educational consultant for the Mississippi Bend Area Education Agency for 35 years. She also served as a school counselor for Bennett Community Schools. Shellady has a Bachelor of Arts from Clarke University in Dubuque, Iowa, and a Master of Arts from the University of Iowa. She currently lives in Iowa City. Fortunate: The Fabulous, Fantastic Filly is available for purchase on Amazon and BarnesandNoble.com.